Our regular Trader Joe’s grocery store, which burned down in the Santa Rosa Firestorm last year, recently reopened and I was looking forward to returning today. Once you get past the overcrowded parking lot, everyone in the store is super nice and very helpful. When I first began my shopping, an older woman in a wheelchair asked me if she was next to the salmon. I happily escorted her up the aisle, where I’d seen it a few minutes previously. She explained that her son is coming to visit and he’d offered to cook it for her. I helped her select a large, fresh filet for them. She confided that she had trouble seeing, so I offered to help her with her list. We chatted while we gathered her orange juice, golden raisins, and gin. She told me that she soaks the raisins in gin for her arthritis, which sounds like a great home remedy. I was almost sad to say goodbye, when I left her off at the register to continue my own shopping. Mama and I read through the TJ’s “Fearless Flyer” newsletter that arrived in our mailbox recently, and together selected several seasonal items we wanted to try. After I’d exhausted myself gathering all the groceries, I still couldn’t find a few things. This rockstar TJ’s team member, Chessy, helped me find the missing goods, recommended several new offerings I hadn’t noticed, and then took my heavy cart to check-out while I went to the restroom. We had a great time talking, and she told me that she loves working there because everyone is happy at work there. On the way out to my car, she even gave me this beautiful wreath, which smells heavenly! 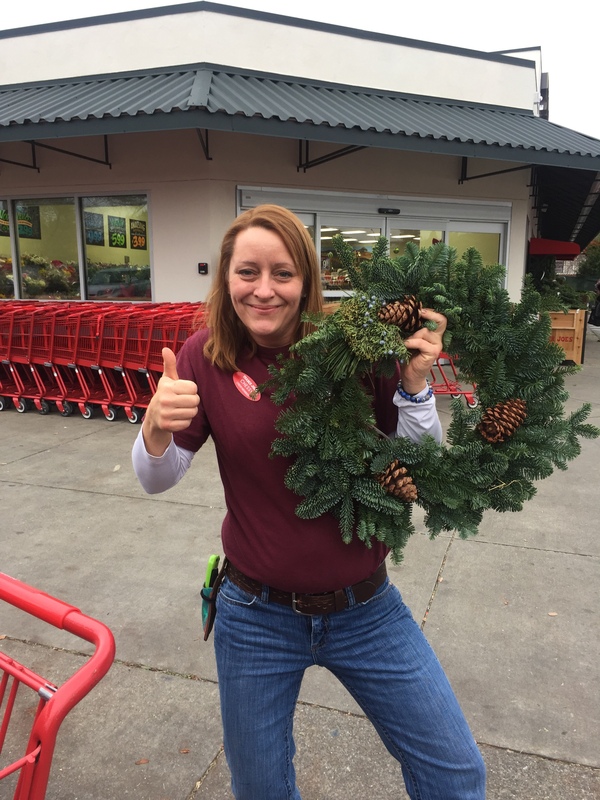 Today’s #OneGoodThing was this lovely wreath gifted to us by Chessy of Trader Joe’s in Santa Rosa. Thanks Chessy! Day 338 of 365. And Day 1,069 in a row (here’s the first 366 & the following 365)! 2 years ago today: Mama finished the book! What a lovely store. And, your kindness never fails to bring a smile to my face. It was the absolute highlight of my day assisting you shop! You have great positive energy! It felt like I had known you for years! I was the grateful one, chosen by you to share our new store with!